Ricky doubled up for the Peterborough Panthers in the Elite League in 2004, and 2005 saw him riding for both Sheffield and the Poole Pirates. Ricky concentrated solely on the Tigers in 2006 proudly wearing the No.1 race jacket, and his best meetings seemed to be when he assumed the captaincy when Andre was injured. Ricky made the No.1 race jacket his own in 2007 and again improved his average. He sustained a wrist injury in the Premier 4's at Peterborough in July causing him to miss four meetings, but scored 16 (paid 18) in his return match against Edinburgh in August. His best away performance was 13 points at Mildenhall which included a thrilling 5-1 with André in heat 15 to seal victory. A moto-crosser since the age of 10, James attended the Sheffield re-opening with his father in 1991 & caught the speedway bug. His first bike was obtained from Chris Wilson, nephew of the ex-rider and current team manager Reg Wilson. James was thrown in at the deep end making his Premier League debut at Middlesborough on April 4 1996, going on to deputise for Sam Ermolenko on at least one further occasion. The '97 Premier League campaign saw James struggling with equipment and then losing confidence and he was allowed to join Newcastle on loan in September as the Tigers promoters gambled on Derrol Keats. James started the 1999 season for the Workington Comets but a nasty burn injury sidelined him for a while. He rode several meetings for the Edinburgh Monarchs before seeing the season out at Stoke. 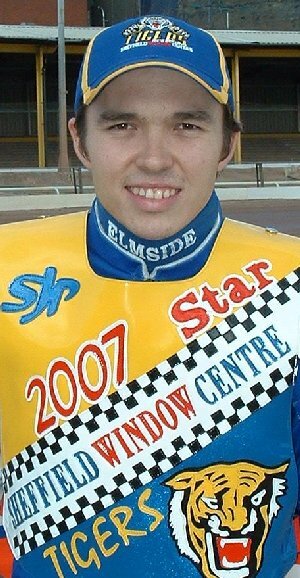 He returned to the Tigers for the 2000 season but was on his travels again the following year riding for the Newcastle Diamonds and top scoring for them at Owlerton in the Premier Trophy with a resplendant 16 points. Back in the Tigers line-up in 2002 and 2003 he was dropped in mid 2004 struggling for form. His replacement Shane Colvin never made the grade and less than a month later James was recalled. James joined Glasgow for the 2005 season racing to a 4.83 average but found himself on the sidelines in 2006. He skippered the Boston Braves in the Conference League and joined injury hit Berwick Bandits but became a casualty himself after just 5 matches finishing with an average of 5.88. Birko returns to the fold in 2007 and slots into one of the Tigers reserve berths. His season came to a premature end after he was fenced by Cory Gathercole against the Isle of Wight in September. He rode on to a 5-1 with Paul Cooper in heat 14 but was subsequently diagnosed as having fractured several bones in his hand. James made his debut for the Reading Racers in 2004 and doubled down to ride four home matches for the Prowlers in the Conference League. He became a Glasgow Tiger in 2005 finishing the season with a 4.84 average, and improved that to 4.97 in 2006. James has also joined the squad of the Scunthorpe Scorpions and is looking forward to some Conference League action. Following Sean Wilson's injury in 2004 André assumed the skippers role and his form led to him being re-called to double-up for the Elite League Poole Pirates. André won the controversial Premier League Rider's Championship passing the unbeaten Simon Stead in the final before they both fell with André suffering injuries to both hands and wrists which brought his season to an untimely end. André secured the services of Peter Carr to maintain his bike for the 2005 season, although he was unable to emulate his tremendous home form on the away tracks, and surrendered his PLRC title when he just failed to make the semi-final. André took over from Sean as captain of the Tigers in 2006, a role which he reprised in 2007 leading the Tigers to the play-off finals in both years. Paul made his debut for the Prowlers in 2003 and rode in their Trophy matches in 2004 when work and grass track commitments allowed. His apprenticeship as a joiner completed Paul signed on for the Tigers in 2005. After a torrid trip to Armadale where he failed to open his account and wrote-off various equipment he bounced back with his best score of the season in the narrow defeat at New Craven Park. His season came to a premature conclusion following his heat 2 crash at Glasgow. He is pictured here relaxing at home just four days after surgery to repair the damage to the ligaments, tendons and muscles in his left knee. Last season Paul top scored against the Isle of Wight with a magnificent paid 17. He then joined Conference League team Scunthorpe Scorpions as cover for the injured Wayne Carter, winning the Conference League Best-Pairs meeting riding with Sheffield team-mate Benji Compton as the Scunthorpe 'B' pairing. Paul them broke a bone in his wrist riding against the Boston Braves causing him to struggle through the Play-off final against King's Lynn. Paul starts 2007 in the reserve berth but is mounted on new JRM bikes and raring to go. A torrid weekend in April saw him blow his best engine at Stoke, and his second engine while guesting at Mildenhall the following day, but bounced back scoring paid 11 against Berwick at home and a match winning paid 14 at Shielfield Park using an engine borrowed from Gary Flint! Paul contested the Conference League Best-Pairs meeting at Scunthorpe representing Boston alongside Simon Lambert and duly won the title for the second year running. Paul took seven rides in the home match against Birmingham after both James Cockle and André Compton crashed out of the meeting. He responded with 17 (paid 19) as we crushed the Brummies with essentially a four man team. His 13 (paid 15) return was key in our away win at Somerset and the Tigers went on to qualify for the play-offs. Paul received an 'end of season' award for achieving the league's highest bonus point score. Joel is steeped in the sport. His father was mechanic to Phil Crump and Joel's first bike was bought from Ivan Mauger! He was first invited over to the UK in 2003 and rode for Rye House in the Conference League, and Reading in the Premier League. He was a member of the championship winning Hull Vikings team in 2004 and only left them after they closed at the end of 2005. The 2006 season saw Joel put more than a point on his average riding for the Newport Wasps and Sheffield (who own his contract) were very keen to include him in the Tigers line-up for the 2007 season. Joel put more than 1.5 points on his average despite riding for most of the season in the no.5 heat leaders position, (a far cry from the Newport reserve berth) and he endeared himself to the home fans with his tenacity as he raced every heat all the way to the chequered flag. Grandson of Roy Wilson who ran the Sheffield training track. Ben joined the Prowlers on his 15th birthday in March 2001. On his debut at Peterborough Ben went to the tapes for his first official race and sped to a dream win. Ben continues to make good progress and has already begun to perfect the 'Peter Carr' third bend dive. Ben got the nod to start the 2003 season wearing the Tigers No.7 jacket. He kept his place the following season and after a slow start to 2004 Ben was showing some real form when he crashed in the 75th Anniversary meeting at Owlerton. He recovered to qualify from the British U21 final at Rye House, but on a rain soaked track at Rawicz in Poland he could only muster 6 points ending his World Championship aspirations for the year. He bounced back by passing Richard Hall (twice) in the final to win the Jeff Hall Suzuki 'Top Gun' Individual Championship in front of his home crowd. Ben made the transition to second-string for the 2005 campaign and continued to improve his average as he has done every season. His form hasn't gone un-noticed and Chris Van Straatan was happy to offer Ben the chance to double-up with Elite League Wolverhampton in 2006. Ben is optimistic that this will help him improve his form on the smaller circuits. Ben became British U21 Champion at King's Lynn on May 3rd. He qualified directly to the final scoring 14 points and kept his nerve to win the title ahead of Daniel King and Lewis Bridger after Steve Boxall fell. His rewarded by being named as reserve for the British Grand Prix at Cardiff. Ben took a bad crash in qualifying for the U21 semi-final in Germany and missed a couple of meetings with internal bruising and lacerations to his hand.